Not to be confused with the song of the same name by the Eagles (which I also love, even though there’s almost nothing less cool than liking the Eagles—but more about that in a later installment). I’m pretty sure that Dad got this record as a gift from my aunt, and as I remember, it wasn’t really to his taste. For my part, I thought the album cover was awesome, and in what was my first instance of pop music geekery, I was delighted to discover that it was designed by Hipgnosis, the same guy who designed the iconic cover for Pink Floyd’s Dark Side of the Moon. 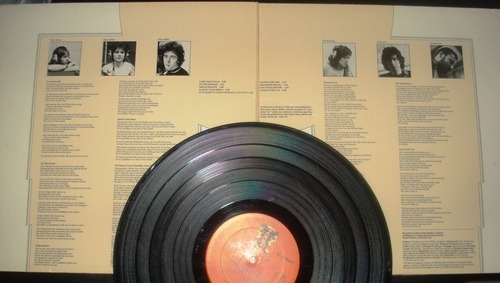 I even liked the interior cover, which had photos of the band members in the studio. I thought that Stuart Elliott (the drummer) looked especially cool (maybe it was the studio headphones), and for whatever reason, I kept picturing him playing drums on this song, probably because of the hi-hat build in the intro. It’s one of a hundred random things that made me want to be a drummer. Weird how that works, huh?